Fourth category, existing on the hard drive but not in the output: Image taken with intent to convert to B&W. Category #3 could include abstracts. Which of these describes an image made by a photographer who picks up after his monkey, uses b&w live-view for composition/structural reasons and then persists in processing with colour because that's reality? At least one of your audience is a reactionary contrarian by nature; seeing the faeces flying around has just made me chill-out about the whole b/w-vs-colour thing (and yes, I've spent a block of 4 years shooting primarily b&w, so I know about the addiction; you've just confirmed that it's right to poke my nose into the a+b channels as well). I think for many nature type photographers and in particular underwater types color and shape are the dominant characteristics of their photos but generating "true" colors is very difficult. In the transparency days, Velvia was the choice of most UW types and now highly saturated color is still rewarded in most competition. Whether the scene really is that color is not so important. Those distinctions makes sense, and if I accept them, then I can also understand why someone might have a preference for black and white. We've read stats on how many billions of photos are taken on a given day and realize that there's a lot of chaff to sift through. Most of the chaff is in color. If you look at black and white photos, the percentage of "good stuff" is bound to be higher, simply because few casual snapshooters bother with it. That doesn't mean there isn't plenty of good color photography out there; it just means you don't look for it the same way you look for good b&w photography. I like to think that I'm pretty good with color, but somehow, I think it's kind of automatic with me; my eyes are attracted to scenes in which color contributes, and often I don't realize it until I look at the resulting photos later. Or maybe I just think I'm good with color, and just choose the ones that work when editing :) I'm getting more deliberate with it over time. It is funny, but whenever a rumor surfaces about Fuji or someone else introducing a black and white digital camera, or someone mentions the Leica Monochrom, the Leica (or black and white?) haters come out in droves. They state categorically what a failure it is, why would anyone want black and white only, what is this artsy thing with B&W, etc. But as you wrote, there are a bazillion boring color snaps out there, and most of them were not helped by the color content. I shoot mostly black and white myself, but some images just have to be color. I usually don't know that until after I've taken the photograph. I look at color as positive and negative space, the same way I think in black and white. I.e. A big block of yellow is positive space, a dark red may be negative, and so on. If I process a color image it's usually because the colors do what I need as far as shape and form are concerned, not just because I like a particular color. Occasionally I process in color because I think it creates the right mood, but not usually. I almost never photograph something because of its color. I find that I do occasionally go back and change good color images to black and white after a while. It's like the color becomes superfluous after a while - a good image can stand without it. I appreciate people who can use color smartly. Ming Thein seems to be one of those folks, although I admit I personally view a lot of those images as photographs for the sake of taking photographs - they don't have a larger purpose. But there's nothing wrong with that if that's how you work. Oh come on Mike, spit it out: what do you really think? What I really think is that I couldn't agree more. And yet, having come from film and then Canon digital sensors, to shooting almost exclusively with a Fuji X-T1, I keep being drawn away from my True Love (B&W) to the seductive colour from the X-trans sensor. I see the image in monochrome as I press the shutter, but when I pull it up on my monitor for editing, the coloured image keeps nibbling on my ear and murmuring, "Admit it, big boy, I've got everything you really want…"
Well, I think you have it backwards. Black and white is an abstraction of the real world and I think that you only like color if it does not disturb that abstraction. The abstraction is what you like and that certainly does not encompass all of photography. Perhaps, one should ask what removing the color from a photograph adds to the image except for nostalgia for a process that had no alternative. No one would countenance your argument if it were applied to painting. It is a little like a lover of charcoal drawings demanding that painting only be done in black and white except that color could be added in narrow prescribed ways. Mike, you comments apply equally to black & white indulgence as well. I see an awful lot of black & white images online that appear to be that way because the photographer is trying to add drama where there isn't any. I've spent years making both b&w and color photographs. I still don't have a firm grasp on which works best for which subject/composition. For me Steve McCurry is a master at taking what you call color pictures. Many of his works would make good black and white photos because of the story in the photo or the graphic nature of the lines, but in color they become great. Even many of his simple headshot photos have colorful backdrops that bring out the color of the subject's eyes or clothing, or give hints about where they were taken. On a totally different veign, I would add another category to "color pictures" and that is documentary work. If you are taking a picture of a bird for example, the color is going to be important whether or not it is pleasing or even adding anything at all aesthetically to the photo. Have a thought for us poor unfortunates who weren't endowed with typical color vision. I'm "color blind" (strongly protanopic, to specify), but I love color pictures. I shot Tri-X and Pan-X when I was starting out, and that was a great way to learn, but my pictures didn't begin to really take off until I started working in color slide film. Something about working in color (however imperfectly seen) made my pictures meaningful to me, rather than just exercises in composition and exposure. The problem I have is that I'm never sure the color in one of my pictures isn't off in some way until I have someone with typical color vision check it for me. And that has to be done on screen, then again a few more times when I go to print. My salvation is that current cameras generally do a pretty competent job with auto color balance, so you're often starting out fairly close to where you want to end up. So if the colors in my pictures aren't pleasing, it isn't for lack of caring or effort - but want of a retinal cone! Good distinctions. Not sure where this fits in, but I'm often (as a hopeless fanboy of Mark Rothko, et. al.) 'after just color', and true, don't pay attention to 'what it's of', cause it's 'of' the color. Or would be if I ever get it right. Thoughts? Good points Mike if a little aggressively made,for a purpose no doubt,good way to spark a discussion. However I think your remarks are relevant mainly to photographers who have a liking for b/w and also shoot colour, to the majority of photograpers who never shoot anything other than colour your opinions are not relevant. I forget who said it but "When you photograph people in color you photograph their clothes. When you photograph in black and white you photograph their soul." Probably why I shoot almost exclusively on the street in monochrome. I reckon that if a picture is good enough you don't notice whether it's in colour or black and white. A lot of male artists are color blind and paint very monochromatically. For instance there was speculation that NC Wyeth was color blind. I mostly disagree with you, and agree with him, and I do think he adds to the conversation. To clarify this, we need to specify one condition -- that the photography is done skillfully. There's no point in demonizing color photography by talking about casual snapshots. Casual B&W is just as bad, and I have old family photos to prove it. B&W is an abstraction, but so is color: but it's less of an abstraction, as proven by Mike Johnston with his color photo of an apple in grass. If viewed by a man from Mars, the Martian would have no clue that the grass is green and the apple red, because the tones are so similar. (This is, by the way, my favorite photo of yours.) A skillful color version, while not nearly as interesting, would provide the Martian much more information, because it's less of an abstraction. In most circumstances (not all, as your photo proves) more information is better than less. Interesting things can be done with abstractions, even severe abstractions, especially in terms of aesthetics. But just because it CAN be done, doesn't mean that it must be; and I personally find the very highest (generally agreed-upon) levels of art tend to deal with the world as it is, rather than as severe abstractions. I would also agree with Windsor in his suggestion of where your appreciation of B&W comes from: from B&W's near-universal use for more than a hundred years, and the consequent development of a complex and sophisticated B&W aesthetic. However, if color had come first, and if B&W was essentially a development that came with the ability to desaturate digital photos, I doubt that aesthetic would ever have developed. I suspect B&W would remain a curiosity, rather than a major force in photography. I photograph in colour because I want to minimize the impression of viewing an interpreted scene. I want photographs that seem to rely on nothing more than assembling the things we see laying around us. I'm sharing an observation: if you stand at this place, and look at these things just so, isn't it interesting how they are arranged? Franz Kline? What about his "brother from another mother," Yves Klein? Have fun trying to reproduce IKB on a computer monitor! Neatly acerbic. Or daring perhaps, given that you are dependent on reaching a wide readership? But good stuff. For some reason my daughter can only reach me via cellphone by standing on the street outside her flat. She admitted just now that she was standing there in her orange Paisley pajama trousers with the purple boots and the acid green plaid patterned jacket with the bright blue knitted cap. Now what would you say to someone who happened by and snapped her, colourfully, as she stood there, and published the photo as art? It's certainly true today that the random camera people pick up comes with color as its default state. But that wasn't true in the 1950s and 1960s; during those years, people moved from doing their snapshots in B&W to doing them mostly in color, even though it was harder and more expensive. While this can't, directly, be taken as evidence about today's casual shooters, it does rather suggest that at least back then, casual shooters felt quite a drive to get colors recorded. Do we make exceptions for press, documentary and street photographers? Shooters who chase subject matter first and foremost? For them, having to work with the color palette presented as they seek their decisive moment, getting the balance and saturation right in the final presentation should be their top concern. A photograph that looks like it came from reality and not from design. This is not to say that photographers with an instinct for color can't have both harmony of tone and gritty reality in the same image. The problem with throwing the faecal matter around is that invariably some of it sticks to you value and everything ends up smelling awful. Firstly I'll start with this. Statistically out of all the gazillions of photos that are taken everyday only an infinitely small number are going to appeal. I see a lot of bad color pics but I see a depressingly high number of monochrome. Because the last entry on your list should be "I can't make this work in colour so I'll turn it into black and white and then it becomes arty". I understand the point you're making Mike, but it can start to sound like the arguments put up by "serious" fine art photographers when Shore, Stern, Egglestone et al started challenging the notion that colour film was only for snapshots back in the 70's. I do hope that we're not going to have to fight that war all over again. I think the biggest problem with colour is that it is one of perception. Some people are very acutely aware of colour and have an almost inanate sense of how to use it, but they are a minority. Next are the people who are aware of colour but have to work at it to try and make it a meaningful part of there visual lexicon. The last group are what I would call chromatically dyslexic and no matter what they do everything seems a jumbled up mess. Here I am only referring to those who are visual arts enthusiasts. The other 90% of people are just making pictures for their own amusement and they are for different reasons other than try to make "art". So now having thrown the brown stuff around a bit lets get the mops and buckets out and break out the Glade air fresher. I have always loved b/w photography and for 35 years was never without my own permanent darkroom. But when Mike says "we make pictures in color . . . . . just because that happens to be the way the devices capture" he misses the point. We make pictures in colour because that's how the world is, and sometimes - perhaps often - we decide that we want a certain level of abstraction (unreality) and we shoot b/w or make b/w conversions from our digital, colour, files. And though I am against the idea of "rules" in photography, there is one simple question we could always ask ourselves when deciding whether to shoot and/or print in colour: is colour a vital or important element of the scene I am contemplating? If the answer is "yes" then you shoot/print in colour. If colour is unimportant or distracting, you shoot/print monochrome. The now "classic" documentary photography that was produced before it became relatively easy to produce "decent" color prints, or even offset or photo lithography, was not produced in black and white for aesthetic reasons. It was the practical choice or the only "choice." It made the photographs less complete as documents and resulted in a form of automatic abstraction. The beauty contributed by the "right" light and good tonal control was ignored just as frequently as the positives and negatives of color may be ignored today. Half or more of my successful photos are the result of my wife dressing our kids. CALVIN: Dad, how come old photographs are always black and white? Didn't they have color film back then? CALVIN'S DAD: Sure they did. In fact, those old photographs are in color. It's just the world was black and white then. CALVIN'S DAD: Yep. The world didn't turn color until sometime in the 1930s, and it was pretty grainy color for a while, too. CALVIN'S DAD: Well, truth is stranger than fiction. CALVIN: But then why are old paintings in color?! If the world was black and white, wouldn't artists have painted it that way? CALVIN'S DAD: Not necessarily, a lot of great artists were insane. CALVIN: But ... but how could they have painted in color anyway? Wouldn't their paints have been shades of gray back then? CALVIN'S DAD: Of course, but they turned colors like everything else in the '30s. CALVIN'S DAD: Because they were color pictures of black and white, remember? CALVIN: The world is a complicated place, Hobbes. HOBBES: Whenever it seems that way, I take a nap in a tree and wait for dinner. Interesting observation by Ben about color palate (something I've never considered). I sometimes use filtering capabilities in Lightroom to see which lenses or settings I commonly use in taking my favorite photos. If I can get a little further along in rating photos, it would be interesting to bring up just favorites and see if I can identify a palate as easily as I can by going to google images and typing in Renoir, Cezanne or Monet. (That's from Patrick O'Hare's "Recent Work" and I'm providing a link to the image since there's no link to a page containing the image). I think I generally tend to prefer monochromatic color images, but certainly appreciate a well done cacophony. I like the subdued color palates of some early color photographers (including Stephen Shore and Eggleston); also some of the bold abstracts by Ernst Haas ("Color Correction" is one of my favorite books) or Saul Leiter. More frequently, I just come across gems among any portfolio, rather than specific photographers who always strike gold. Like some of the other commenters, I really like B&W, but I like color too. And sometimes I can't decide what works best for a given image. I really like the warm colors and the blue sky, and the way the two merge. But I also like it in B&W. Generally I like the B&W version better, but if I only look at the B&W one for a while, then I see the color one, all I see is what's missing from the B&W one! Wait a minute. Wait a minute here. There's some good stuff in Winsor's comment. I like his idea that B&W is an abstraction of the real world. And I think that it is a seriously good question to ask what removal of colour adds to the image. One of the first things my mentor, Bjørn Rørslett, taught me when I was learning UV/IR photography was a photo has to 'stand on its own' regardless of what wavelengths it is shot in. Shooting a scene in IR, for example, is not enough to make a compelling photograph if the scene is boring or the composition is stale or if there is no idea behind the making of the photograph. Extending that principle, it is legitimate to ask whether the photo stands on its own before removal of colour. Does the B&W enhance an already good photo? Or is it simply an affectation? Speaking of color, what ever happened to the "Quiet Color" project? It has been my observation that it seems easier to obtain some homogeneity in a black and white body of work than in color. But maybe I am lazy. But viewed in black and white those atrocious clothes covered all the Zones? Curiously, F Kline and Y Klein seem to define the opposite sides of this dialectic. Perhaps Hubertus Bigend's International Klein Blue suit would work well in both B&W and color? Paint me cynical but, who needs colour when the real world is so black and white! Mike, do you like Peter Turner's work? The Kline link got my antivirus software excited, said there was a threat and deleted it. My wife had to laugh when I read this post to her as it could have been me writing it. I enjoy viewing both colour and B&W photographs as well as making both, but lean very strongly towards the B&W side. Some question the removal of colour but IMO fail to see in B&W before taking the picture so that the removal as an afterthought is not what it is about. 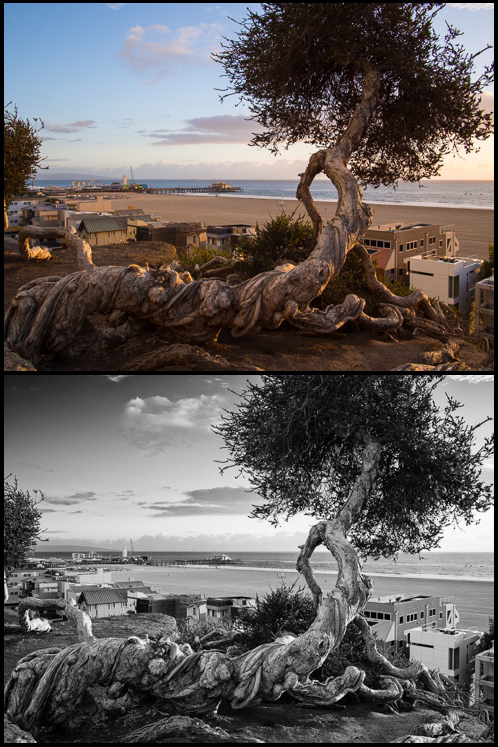 If I compare the same photo in colour and B&W, especially when I intended it to be in B&W, the colour is a distraction. From what I am trying to say, and by introducing an emotional component in the colour which wasn't there in my mind when taking the photograph. I think the emotional response to colour varies to some degree between people and therefore doesn't necessarily convey the artist's intent accurately. My real life experience with colour in the world certainly doesn't coincide with the penchant for over saturated colours in the majority of photos these days or even Velvia for that matter, so the "real world argument" doesn't wash with me either. The more intense the colours the stronger the emotional response, the more generally popular the image? Pete Turner used to be a very prominent photographer, who seems to have been pretty much forgotten lately. Bright, highly saturated colors were definitely his thing - largely the point of many of his photos. Would you classify them as "Color Pictures" or "Pictures of Color"? Some of both? Another aspect in the development of the B&W aesthetic is printing processes. So photos in newspapers (which rely on the cheapest printing) were B&W for a long time into the color era, and further back, nearly all magazines and newspapers were B&W, including any illustrations (often etchings, before photography was established or at least before halftoning was practical). So nearly anybody who interacted with the world saw B&W images; not just people examining early photographs or attempts at photographic art. Coincidentally, one of Brain Pickings posts for the day is on Rothko's book: http://www.brainpickings.org/2015/02/17/the-artists-reality-mark-rothko/ They always do a nice job of making me want to find and read the whole book. You think photographers are picky about color? A guy I know restores cars for Ralph Lauren, including his Ferrari GTO - see below. RL sent him two Land Rovers to paint for a photo shoot for a fashion ad. He sent along color samples for the vehicles, a custom shade of green. This guy painted his Land Rovers and RL rejected the color. So he stripped them to bare metal and did it again. And when that was rejected, he did it a third time, which was acceptable. 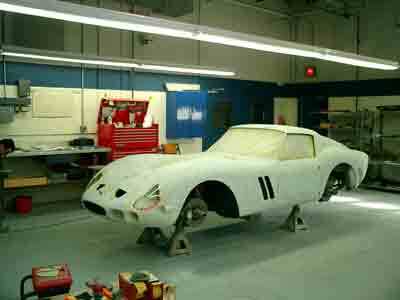 I saw the GTO while it was being restored and in primer. Here is what it looks like but the photo might be better in color. ... where is Mike demonizing or dissing color photography, in any way, in that column??!! He's parsing why some color photographs succeed and others fail, why sometimes color improves and sometimes it detracts. That's hardly a blanket condemnation... unless you think anything short of blind adulation is hatred. As someone who works almost exclusively in color, I think I might notice if he were dismissing my art. As for the bizarre notion that Mike dislikes color photographs-- he loves quite a number of mine. I show him my work on an annual basis and he really, really likes a number of the works. He tells me so. thanks for introducing me to Franz Kline. didn't know him before. you might like to look into the work of Asger Jorn, too - at least to my eye, there is some similarity. concerning for colour photos. generally, i prefer B&W. be it for the overwhelming presence of great B&W photos of the past, or for the subtle simple (???) beauty they sometimes have. however, at times colour is a necessity; when i go for colour, it's colour only, with no thought of desaturating later. Aspects of Moose's comment and the Rothko comment hold weight for me. I also understand why Bob brought up "Quiet Color" because I remember being really interested in that project and the example photos you posted for that, Mike. I guess I find myself liking pictures that look like someone painted them. What I mean here particularly, when I think of paintings, are ones where the painter laid out brushstrokes of color with very subtle variation so as to show a kind of texture of a surface or wall, or the complexity of skin (think Egon Schiele), or the "texture" of light (Hudson school painters), etc. Those mostly monochromatic portions that ain't monochromatic at all because the painter's working hard to fake the complexity of reality. I think some of that kind of complexity I see in some photos (of the kind I'm imagining here) can be lost in the conversion to black & white. Ed Hawco's posted photo of the tree works for me better in color particularly because of all that mottled goodness of browns and tans that make up the trunk of that gnarled tree. What keeps popping to mind is a post on TOP some time back of a photographed portrait of Cormac McCarthy. Cormac's skin, his shirt, a wall, they all had this kind of variation that made the picture so strong for me. It was probably a photo that would have been fine in black and white, but oh that pastel-y color! "Another technique is to substitute color for value. Painters are limited to the same 5 to 7 stop range from shadow to highlight that photographic printers have, but the range of available colors is much greater. Some of the limited available contrast range may be consumed depicting (say) the highlight-to-shadow transition of a cylindrical tree trunk, curving away from the viewer. But part of that transition can be illustrated with a warm to cool color shift, which conveys an impression of 'roundness' or volume, while saving a bit of contrast that can be used elsewhere for more differentiated shadows." Geoff's not advancing my point, but laying out some of the things I admire visually in (color) paintings. So I guess with color photos I like it when the reality captured mimics the hand of art. Weird. In fact it was this picture that gave me my favorite unattainable photographic goal: to take a great black-and-white picture of a rainbow. I've made no progress toward this goal. The palette produced by default from each camera is subtly different, which doesn't help. Images from my Nikon are unerringly neutral to the point of blandness and I feel the need to take control. It is very easy to push colour around in a way that makes hue, and not tone, the defining feature of the image. Colour can actually enhance tonal separation if used judiciously. It can add emphasis which a monochrome image would miss, and that emphasis may be entirely relevant. Overdo things with the saturation slider and it can just as easily obscure relevant detail in a "Where's Wally" confusion of equal tones that compete for your attention. Far too many images look like a home made New England quilt. Conversely Black and White seems to be the go-to remedy for amateurs who mess up colour. Instead of using colour to separate elements of a scene, they give up and make it look 'artistic' with equally dire results, producing something with no meaningful emphasis at all. It's very easy to develop a phobic aversion to certain 'mistakes' when so many millions of images are foisted on us daily. They gnaw at your subconscious until you recoil involuntarily. But in the end we are just talking about bad composition, clumsy choices and lack of direction. B&W, colour - both require careful judgement and an eye for the compositional elements of a scene. These elements are missing in 99% of images posted on the web. But in the end the issue is always the relationship between tones (whether colour or B&W). It has a much to do with choice of scene as anything else. Some things just don't make good photographs and no amount of messing about will change that. Gueorgui Pinkhassov's work is another very good example of color photography. A big portfiolio of his work can be found here: http://www.magnumphotos.com/C.aspx?VP3=CMS3&VF=MAGO31_10_VForm&ERID=24KL53ZVNE (it can't be linked directly, but scroll down to the portfolio called "Just Light Like"). I see Winsor's comment as an attempt to get the conversation back on track, when it has gone completely off the rails near the start. Isn't it true that BnW became a popular substitute for color because of technical limitations (or, in the beginning, complete lack) of color photography? It's nice that some folks can make good use of the limitations of BnW, and I'm sure it's much harder to use all of the capabilities of color, but BnW is by now just an artificial limitation. Lovely "tones" apply equally to color photos. [Isn't it true...? Of course it's not true. Color photography was viable in the nineteen-teens (autochrome) and fully mature by the 1930s (Kodachrome and dye transfer), but even in the 1970s was still controversial for "serious" work. This Webby idea that color is a new thing and earlier photographers had no choice is simply ignorance of history. It's much more complicated than that. And then, of course, there are photographs that are predominantly B&W even if they are shot in color, such as a lot of my urban night work, because neither our eyes nor cameras perceive color in very dim light. Eggleston proves to me that seeing matters more than whether it's monochromatic color or highly saturated. 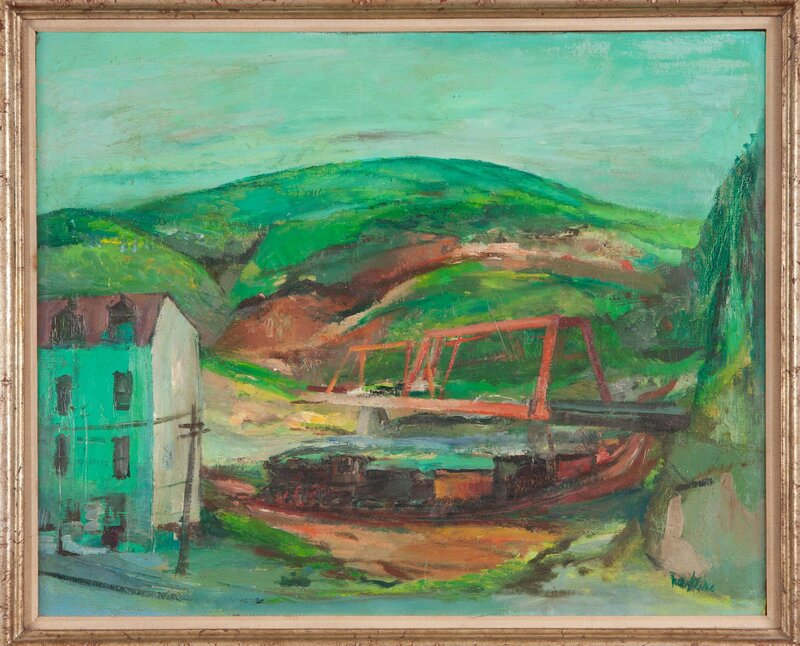 His oversaturated works are fitting to the subject, much like Bob Dylan's voice suits the song. Hmm. I thought I had stated it clearly, but you agreed with me: color had limitations, and BnW allowed more control. Now it's changed.